The theory of hereditability of acquired characteristics puts natural cooperation as opposed to natural selection as the basis of evolution. The endosymbiotic archaea secrete RNA viroids. The archaeal RNA viroids are converted to DNA viroids by endogenous HERV reverse transcriptase and integrated into the genome by HERV integrase. Archaeal endosymbiosis can occur consequent to global warming which leads to increased colonic archaeal growth and endosymbiosis. Archaeal endosymbiosis can occur following dietary fibre deficiency, stress and exposure to EMF. The archaea will secrete RNA viroids which can get converted to DNA viroids and get integrated into the genome functioning as jumping genes modulating gene expression. The RNA viroids and their DNA templates getting integrated into the genome consequent to environmental stress leads to genomic flexibility and dynamicity which can be inherited. The archaeal endosymbiosis and symbiotic genomics lead to human evolution and development of the human brain with its unique characteristics. 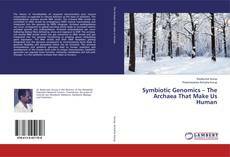 Symbiotic genomics can regulate brain function, immunity, metabolism and cell cycle changes. It is the symbiotic archaea that make us humans.